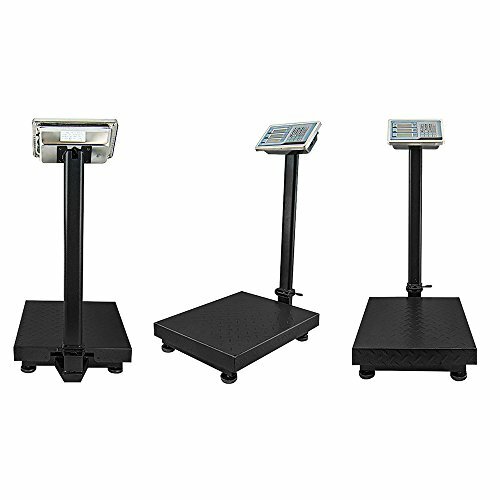 The 600 LB Digital Platform Scale is a fast and reliable battery and AC operated weight scale. Great for outdoor or indoor, warehouses, shipping/receiving, fulfillment centers, and all other high volume industrial and commercial operations! This fantastic platform scale is perfect if you require an accurate weight reading of as little as 0.5 lb up to a maximum of 600 lbs. The durable stainless steel platform allows for larger items to be weighed with ease and the simple to read screen makes weighing easy. This scale can also add different goods of different weights and unit prices! Put X amount of goods on the scale, then enter the unit price, push the add button and then put more goods on the scale. The total price will keep a running money total. This can be repeated 99 times. Has a Zero Button. Also a Tare Button, On/Off Button and Rocker Switch (on the back), Auto Test and sets to Zero when turned on. ACCURATE AND PRECISE: 600 lb Maximum Weight, .05 lb Precision. Weighing platform measures 19.5" x 15.75". AVANCED COMPUTING FUNCTIONS: Zero, Tare, Add, Store, M*, C. Weight and store 99 items in scale memory. PORTABLE AND SAFE: Rechargeable Battery for 150 Hours of Additional Use or Directly Plug-in 110V Power Cord. CONSTRUCTION: Features an easy to clean stainless steel platform.